We supply mobile fast-tow decontamination trailers for use by contractors who are required to provide temporary site hygiene / decontamination facilities for personnel. 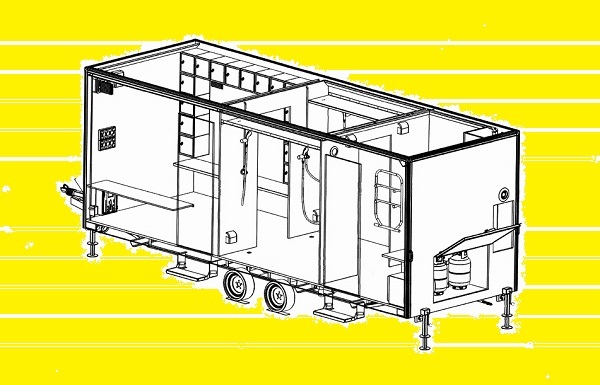 From the smallest unit, the Micro, through to the largets unit, the Maxi Quad XL, the range encompasses 10 different models of decontamination trailer. Three separate compartments providing Clean, Shower, & Dirty areas. Thermostatically controlled hot water showers. A HEPA-grade air ventilation system, supplied with a current test certificate at the outset of the hire. Specification of each model varies according to application & user requirement , and includes options such as integral clean-water tanks, long-run on-board generators, knee operated wash basins, waste-water filtration, boot-wash units etc. "Standard" models require connection to site services, while "Self-Contained" models have integral clean-water tanks and generator. Just some of these products are featured on the following pages; feel free to discuss your particular requirement with our hire desk staff.